The government has threatened to cancel the coal block allotted jointly to ArcelorMittal and GVK Power in Jharkhand for their inordinate delay in developing the property. 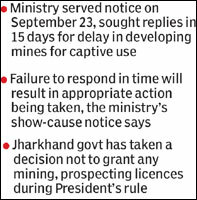 The coal ministry served notice on September 23 to both companies and sought replies within 15 days, seeking reasons for the delay in developing the mines allotted for captive use. In spite of the passage of almost one-and-a-half years, no serious effort has been made by your company to develop the coal block as per the milestone chart appended to the allotment letter. Consequently, the development of the coal block has been inordinately delayed, the ministry said in its letter. The ministry said exploration has not yet begun, whereas it should have been completed by now. Asking both companies to reply within the stated timeframe, the ministry said, Failing which it will be presumed that your company has no explanation to furnish and action as appropriate will be taken against your company for de-allocation of Seregarha coal block. When contacted, ArcelorMittal India CEO (mining) MP Singh said, ArcelorMittal has received the show-cause notice. But the delay is not because of us. We will reply appropriately to the coal ministry soon. GVK Power also confirmed receiving the notice. ArcelorMittal was alloted the Seregarha block in Jharkhand to meet the 103.50 million tonne coal requirement for its 750-mw captive power plant at Sariakela in Jharkhand with GVK Power, which needed 82.80 mt of coal for a 600-mw power plant in Punjab. It is learnt that the Jharkhand government has taken a decision not to grant any mining or prospecting licences during the prevailing Presidents rule in the state. The steel major is struggling to obtain various regulatory clearances for its proposed Rs 1-lakh crore steel plants in Jharkhand and Orissa having 12 mt per annum capacity each. The ministry has also issued a show-cause notice to state-run trading firm MMTC, the second such notice to the firm in just over a year, for its failure to develop the Gomia mine allocated to it in Jharkhand.